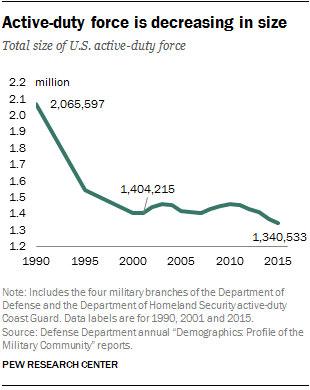 As the size of the active-duty U.S. military has edged downward, its demographic makeup has changed, largely in ways that reflect trends in the broader society. There were 1,340,533 active-duty troops in 2015 (including those serving in the U.S. Coast Guard). This marks the smallest active-duty force since 2001, according to a new Pew Research Center analysis of data from the U.S. Department of Defense (DOD). In addition, the share of Americans serving in the active-duty military has declined marginally to 0.4% of the population in 2015 (down from 0.5% in 2009). Here are some key facts about today’s military. 1 The Army remains the largest branch of the U.S. military. 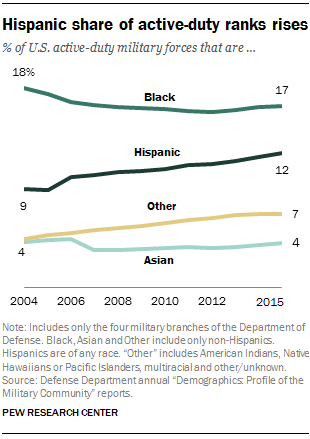 In 2015, 36% of all active-duty military personnel were serving in the Army. The Navy and Air Force were comparable in size, each accounting for roughly a quarter of active-duty personnel. 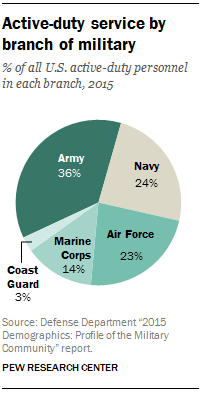 The Marine Corps made up 14% of the active-duty military, while the Coast Guard made up 3%. The Army, Navy and Air Force are substantially smaller in numbers today compared with their size in 1990. The size of the Marine Corps’ active-duty force has also decreased, but not to the extent of these other branches. By comparison, the number of active-duty members of the Coast Guard has ticked up. 2The active-duty force remains largely male-dominated, but women have made inroads in recent decades. 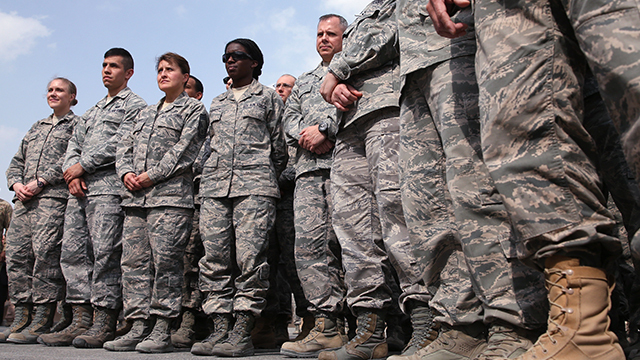 Overall, 15% of DOD active-duty military personnel are women, up from 11% in 1990. In 2015, 17% of active-duty officers were female – up from their share of 12% in 1990. And 15% of enlisted personnel were female in 2015, up from 11% in 1990. The share of women in the ranks varies significantly by service branch. Women comprise nearly one-in-five active-duty personnel in the Air Force (19%) but only 8% of all Marines. Women make up 18% of the Navy and 14% of the Army. 4The active-duty military has grown older in the past 40 years. Roughly two-thirds of all DOD active-duty military personnel were ages 30 or younger in 2015. Only about one-in-ten (9%) were older than 40. Even so, since the military draft ended in 1973, the average age of officers and enlisted personnel has increased. The average military officer was roughly 34.5 years old in 2015, up from 32.1 in 1973. And the average enlisted member was just over age 27 in 2015, compared with age 25 in 1973. The age gap between officers and the troops they lead has remained consistent over that time period. 5Military officers have considerably higher levels of educational attainment, on average, than enlisted personnel and U.S. adults. More than eight-in-ten DOD active-duty officers have at least a bachelor’s degree, including 42% who hold an advanced degree. They are four times as likely as average adults ages 18 to 44 to have completed a postgraduate degree. The educational profile of enlisted personnel is much different. 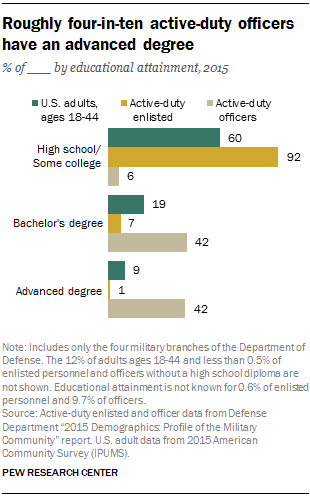 The vast majority of enlisted personnel (92%) have completed high school or some college. This compares with 60% of all U.S. adults ages 18 to 44. Fewer than one-in-ten enlisted personnel (7%) have a bachelor’s degree, compared with 19% of all adults ages 18 to 44. 6 There is much more to the U.S. military than the active-duty force. In recent conflicts around the world, the National Guard and Reserves have often fought alongside the active-duty military. In 2015, 826,106 adults served in the Selected Reserves – those National Guard members and reservists who were available to be called to active duty. An additional 275,247 adults are in the Inactive National Guard and Individual Ready Reserve and do not engage in regular training or active-duty drills. The Army National Guard and the Army Reserve make up the largest share of the Selected Reserves (roughly two-thirds together). The Air National Guard and Air Force Reserve account for an additional 21%.